Despite the economy, attendance was actually slightly ahead of last year at around 12,000 (being in DC undoubtedly helped). On the exhibit floor, most of the big exhibitors and (last year’s) booths were back (with a few notable companies missing). The exhibit hall felt busy, although with less energy via fewer marketing dollars spent by networks on floor activities (no Mad Men cocktail party this year AMC?). On the panels one of the most prominent messages was that cable CEOs wanted everyone to know they are not on the newspaper business arc. While I think this is true, I see a "newspaper like" trend in their core business – residential video services. But, this trend can be slowed or even reversed with the help of advanced TV advertising and services. What’s this "newspaper like" trend? 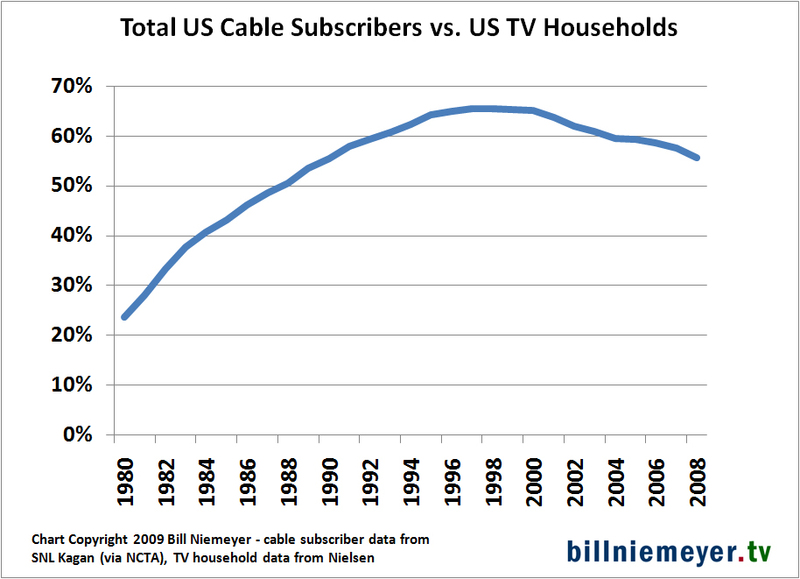 It’s cable’s declining video services share of US television households. Certainly the MSOs are in a very different and much stronger position than newspapers. Part of this strength comes from the cable operators’ triple play (video, broadband, voice) and other services. But, residential video services still provide well over half of revenues for cable operators. In 2008, according to the NCTA, 60% of cable’s $86 billion in revenues came from residential video (in 1998 it was 82%). And, for the last 10 years there’s been a steady decline in the percentage of TV households getting their multichannel TV service from cable. See the below chart based on data from the NCTA (from SNL Kagan) and Nielsen. 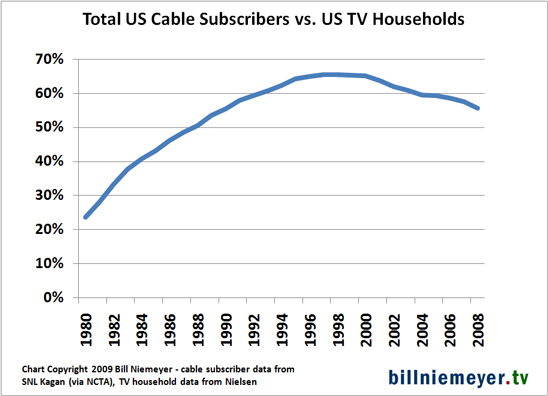 Cable’s share of TV households peaked in 1997-98 at 65.5% and has declined every year since. It was 55.6% at the end of 2008 – an average of one point lost per year. What’s driving this decline in share? Over most of the past 10 years it was DIRECTV and DISH moving from their initial base (rural and other markets underserved by cable) to compete directly with the major MSOs. And just as satellite adoption started to slow, here comes the telcos led by Verizon and AT&T. It could be that cable doesn’t mind losing low revenue subscribers to others. But while that characterization might be true of the consumers acquired by DISH, it certainly isn’t true of the high RPU subscribers acquired by DIRECTV, Verizon and AT&T. Unfortunately for MSOs… telcos and satellite can also improve their viewer experiences using the same techniques. In some cases they are already ahead of cable (the interactive service deployed by DIRECTV for NFL Sunday Ticket is an example). And there’s the Internet. While online video use is still small relative to TV viewing (see this past newsletter for more details), it’s capabilities for interactivity and reporting are already well ahead of TV platforms and advancing faster. When low cost and easy to use "over the top" finally gets broadband video to US TVs in scale (as Moore’s Law and the last several decades of digital tech development says it will), MSOs will need to be already "spun up" with their advanced video capabilities. They need to accelerate development dramatically now, or risk seeing further declines in video services market share or becoming simply a broadband pipe for others to leverage. Advanced TV advertising was featured prominently on several panels, including Canoe Ventures and technologies ETV and tru2way, particularly on the last general session of the show – "Economics of a New Advertising Era." David Verklin (CEO Canoe Ventures) said "Community Addressable Messaging" (or CAM – formerly known as "Creative Versioning" – national zone targeting of linear cable network ads based on demographics) would be launched in six weeks covering 48 million homes, with participation from at least two national networks. On the same panel, Steve Burke (COO Comcast) and Landel Hobbs (COO Time Warner Cable) were also promoting Canoe, ETV and tru2way. To address the skepticism regarding advanced TV timetables – Hobbs said "don’t mistake quiet for inactivity" – Burke said "it doesn’t matter why addressable took so long" the question should be are MSOs now committed? He says they are. Also featured – cable networks moving to broadband in cooperation with operators ("TV Everywhere" for example). Of note… the Internet has apparently accomplished a new magic trick. It has turned the cable operators’ deep dislike of carriage fees into affection for the newly named "dual revenue stream content model" (ads plus fees). Likely because these same fees now give MSOs leverage over cable networks’ move to online video. Indexing Cord Cut-ability – How Much TV Do You Lose Going Online-Only? Copyright © 2019 Bill Niemeyer.